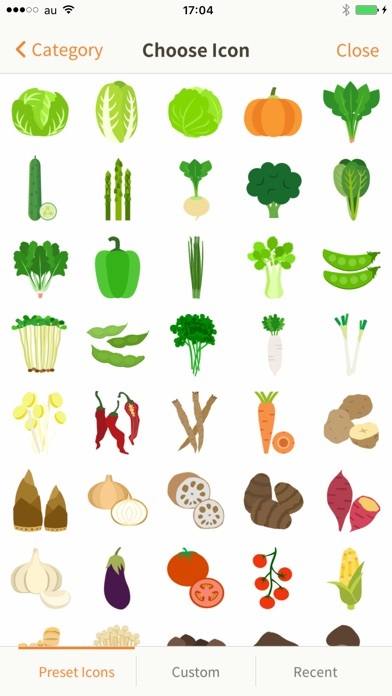 Have you ever wondered if you still have stocks when going grocery shopping? "My Inventory" will help you in such situations. 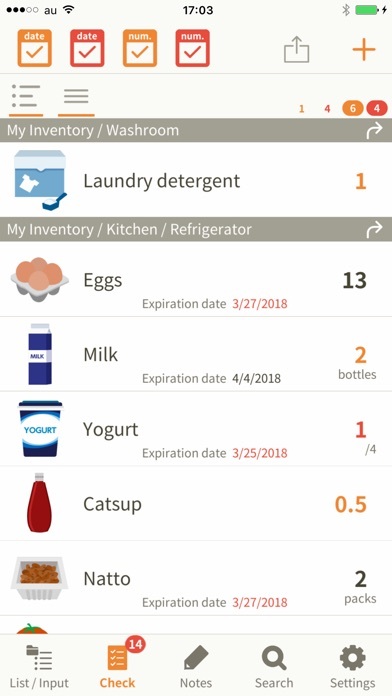 Quickly launch the app, and check your inventory. Enter the number of pieces or expiration date of the commodities in your fridge or kitchen storage, for example. 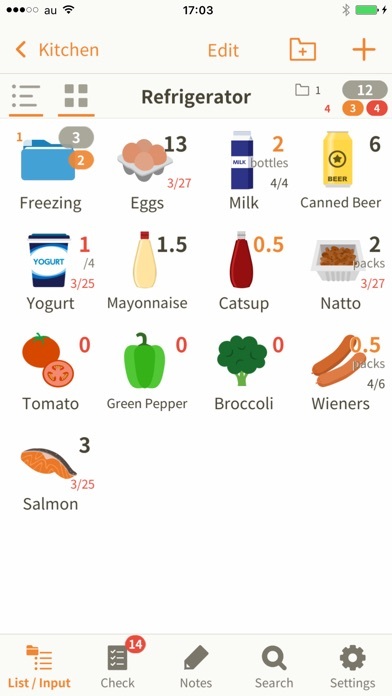 Then subtract number when you use them or add when you restock the products. 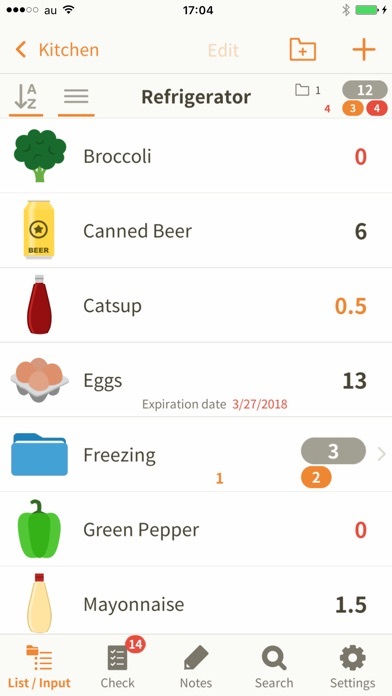 This application helps you keep track of what you have at home, so you don't need to prepare notes before going at the grocery anymore. Furthermore it allows you to: 1. Take note of the price or store where you get a product. 2. See frequency of use (The increase and decrease will be recorded automatically). 3. Write down whatever you want to keep in mind in the Notes field. The app features more than 600 icons. If you don't find an appropriate icon, you can take a picture and create your original icons. It also allows you to organize groups for your convenience. The items that are running out are shown in the Checklist. 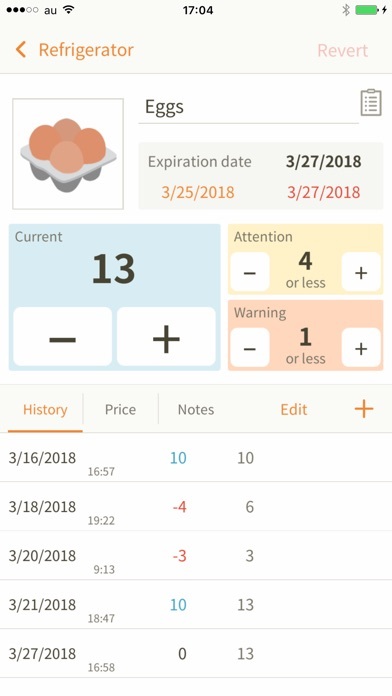 Each item can be set to show a given number of warnings. When you restock the item, the warning will automatically disappear from the Checklist. Why don't you start using "My Inventory" as your daily living tool? iCloud supported. It is useful for backing up and sharing data. [Changes & Point to be noted] - The old versiondata will be converted to new data at the first launch - Emoticons cannot be used * * This App is Viewer Edition. There are the following restrictions. * More than 10 items cannot be registered. Please buy new My Inventory! 3 stelle perché la App è fatta bene e ad un prezzo ragionevole. Ma ha un problema da me: quando aggiungo una nota, la App mi butta fuori. Risolvete per avere la 4 stella. Un'altra pecca è che non ha la possibilità di esportare e importare il database dei prodotti inseriti. Sul Dropbox purtroppo non crea nessun File. Quando lo aggiungerete vi darò la stella numero 5. Die App bietet vieles aber leider kein Management über Barcodes. Das erschwert die Eingaben. Ansonsten ist die App ganz gut. Leider keine Version für das iPhone 6.. 1,99€ für ein zu kleines Bild bezahlt. Synchronisation nur über Dropbox möglich Export sonst nicht möglich! Preis -Leistung ok.
Klappt prima, bin sehr zufrieden. Hi, endlich habe ich einen super App gefunden wo ich meine Vorräte erfassen und vewalten kann. Danke an Euch. Den letzten Stern gibts, wenn eine Sortierfunktion eingebaut ist. Die würde das Gesamtpaket abrunden. Macht weiter so! Update auf IOS7 wäre toll!!!! Habe viele Inventar Apps gekauft, war von dieser begeistert und hab losgelegt. Nun, mittendrin, kann ich nichts mehr eingeben, bei jedem Versuch Absturz. VIEL ARBEIT UMSONST Das ist ärgerlich . Ansonsten wär die App Spitze, endlose Hierarchien sind möglich, Scanner wäre noch gut... Aber, so oder so, 85 Einträge reichen nicht im Entferntesten. Schade ! Ich habe schon lang ein solches App. gesucht, schön, praktisch, gut. Allerdings den fünften Stern gibt es, wenn es einen Barcode-Scanner dazu gibt:-)👍👍Weiter so! Noch habe ich nicht alle Vorräte angelegt - aber dieses Programm scheint mir schon jetzt einfach nur empfehlenswert zu sein - ich kann selber die Art der Ordner bestimmen und auf diese Weise sogar locker 2 verschiedene Haushalte unter Kontrolle halten. Das Programm ist leicht zu bedienen, sehr übersichtlich und bietet wirklich alle nur erdenklichen Eingabemöglichkeiten. Grosses Kompliment!